Now that January is here, I’ve begun the unenviable task of storing away the holiday decorations. Each year, this ritual propels me into a little winter-time “spring cleaning.” This process is more of a purge really, as the practice of packing and storing so much stuff often reveals those little things here there that I’ve been overlooking for months now. As I found and trashed things I’m not using and don’t need, I considered what caused me to hang on to items like these in the first place. Perhaps understanding that aspect better would help me keep from accumulating hidden caches in the first place. Wrapping paper scraps. I saved larger pieces, but some were too small to be useful. Out they went to the recycling bin. Old greeting cards. This one can be tricky, as it’s quite possible for a card to have great sentimental value. But not every card from every person has to be saved. We’ve written about parting with sentimental keepsakes before, and I used this advice to guide me. Magazines. There are clever ways to avoid magazine clutter, but I wasn’t keeping up with those. Out with the old magazines I’ll never read to the recycling bin. Balking at the work involved. I’m talking about small items, but there was a lot of it. It’s easy to get overwhelmed by the amount of energy a good purge like this will require — realistic and/or imagined. Panic at the thought of throwing away something necessary. What if I did need that raffle ticket stub? Are the receipts in my wallet important? This concern has prompted me to keep more than a few items unnecessarily. It’s embarrassing to ask for help. Even though many of us have these hidden caches of stuff, it’s still unpleasant to introduce someone to it, even if the intention is to go through and throw things away. Is the situation as big as I’m making it to be in my head? What can be safely thrown away? Can’t I just get over myself and ask others to help? What’s the most common factor that has allowed this stuff to build up? Related to the last: is if you successfully identify what that is, is there a way to address it? Answering these questions will go a long way toward staying on top of these often unseen collections of clutter in the future. Happy winter-time spring cleaning! When we think about clutter, we rarely think about sounds. But managing the sounds we let into our lives can definitely make our lives better. The following are some of the sounds in many of our homes and offices, along with ideas about how we can control or improve them. For a long time, I woke up to an alarm clock with a pleasant chime. I’ve recently realized that my clock is a unitasker I may no longer need, and I’ve switched to waking up to music selected from a playlist on my iPad. Other people like the Philips wake-up light, which gradually lights up the room over a 30-minute period, so you may wake without an alarm sound at all. (But if the light doesn’t wake you, it’s followed by an alarm: natural sounds such as birdsong, or an FM radio station.) And these are just a few of the many choices available when it comes to alarm clocks. 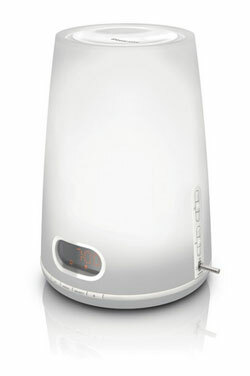 Some people may need an alarm clock with a jarring sound in order to wake up. However, if you’re not one of those people, why not start the day with sounds you enjoy? I still have a landline, and I don’t like the standard telephone ring sound. Therefore, I’ve installed a Now and Zen Tibetan phone bell, which sounds quite pleasant. Some items are inherently noisy, but we can at least consider the noise factor when making new purchases. When my garbage disposal broke and I had to replace it, I was amazed at how much quieter the new one was. One of the many things I like about my shredder is that it’s quieter than many others. Conversation, laughter, song — these are some of the good sounds we might share with those we live with. And some sounds, such as a baby’s cry, are important for us to hear. But sometimes we don’t want to (or need to) hear our family members. For example, does someone in the family play an instrument, which involves a lot of repetitive practice that drives others to distraction? When possible, try to provide a space where this practice can be done without everyone else having to listen. This might mean a room that’s away from where the rest of the family congregates. Soundproofing is another possibility. Sometimes we can control the sounds from outside our homes. While it’s never a sure thing, landscaping can be designed to attract birds or frogs. At certain times of year, I hear frogs croaking in my yard, and I love it; other people would find it annoying. People who find wind chimes to be “exceedingly beautiful” can often hang them outside their homes; people who don’t can remove any left by prior tenants. Other sounds we can’t eliminate — such as noisy strangers sitting near us on an airline flight. If such sounds are a frequent problem, investing in noise-canceling headphones might be worthwhile. Another unavoidable sound for some is ongoing street noise. While we can try to select apartments, homes, and hotel rooms without street noise, sometimes that’s not an option. In such cases, a white noise machine — or sometimes just the white noise of a fan — can be a big help. A more drastic and expensive option would be installing soundproof windows. Yes, some of these solutions involve adding one more thing to our lives. But if that thing allows us to get a good night’s sleep, or if it allows us to concentrate when concentration is needed, it’s probably a worthwhile addition. Being an unclutterer doesn’t mean depriving ourselves of things that significantly enhance our lives. A couple months ago, I purchased the digital version of 57 Secrets for Organizing Your Small Business by Julie Bestry. Julie is a professional organizer specializing in office and paper organization, and I thought her secrets might be useful for Unclutterer’s readership and for myself. If her name is familiar to you, she has appeared on the site in the past. 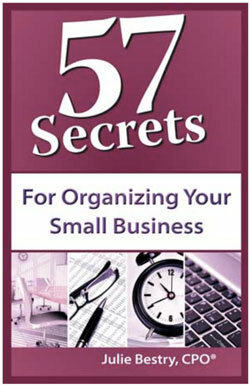 While there are 57 short chapters in this book, there are more than 57 secrets for keeping your business organized. Each chapter is packed with useful and easy-to-implement tips that immediately solve organizational problems for anyone who works in an office or maintains an office in their home. Create checklists and scripts. When meeting with prospective clients or vendors, the same questions are asked each time. By writing these questions down and creating a script or checklist, interviews and meetings will go much more smoothly and you’ll have all of the information you need. These checklists can also be important when training staff to perform these tasks. Design templates. Instead of creating responses to each inquiry from scratch, develop letters (or sections of letters) that can be easily reconfigured to create responses. Simply copy and paste the required sections and customize the key points. For Gmail, templates can be made using “Canned Responses” from Google Labs. Observe and document rituals. Build routines for complex tasks such as bookkeeping or data-entry. Write down each step in detail so that if you had to turn the entire project over to someone else, such as a virtual assistant, the work would be completed correctly and to your standards. Julie also describes how to write effective emails and make productive phone calls so you get all of the information you need at one time instead of sending dozens of messages back and forth between coworkers. Like many professional organizers, Julie encourages readers to set goals and become masters of their task list. 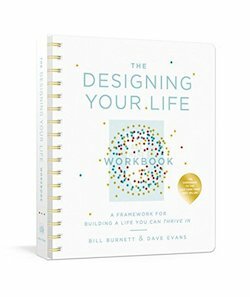 The advice Julie shares in this book help readers discover which type of “to-do” list is best suited for them. She also talks about goal setting and attainment the “SMARTY SKIRT” way. Julie teaches readers how to be a “File Whisperer.” She clarifies for how long documents should be kept and offers alternatives to the traditional filing cabinet for document storage. She also describes how to escape the traps that many people fall into when they build a filing system. Julie even shares secrets to building an effective mobile filing system for those who travel for business. Schedule specific office hours and share your schedule. By creating specific office hours and sharing your schedule with co-workers, they will know when you are available to answer questions and help solve problems. By leaving a memo-board on your office door people will be able to leave messages for when you are available. Arrange your furniture. Keep the extra chair outside your office door and bring it in only when visitors are expected. A chair could be positioned at a small desk or tucked in a corner so unexpected visitors would be discouraged from staying longer than necessary. Designate gatekeepers. During designated office hours, specify someone else to deal with non-emergency problems. For example, a virtual assistant might respond to all general inquiries or in a home office situation, a spouse or older child might deal with all household related issues. 57 Secrets for Organizing Your Small Business was a pleasure to read and was peppered with references to pop culture (Does everyone remember Gladys Kravitz?) and famous people such as George Clooney. Julie’s comparison of loose papers to “floozies” made me smile, not only because it was funny but a surprisingly useful comparison. 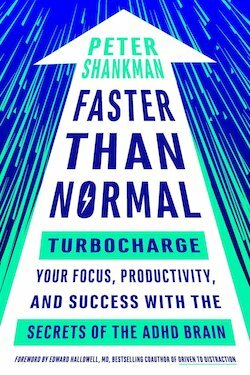 Whether you are the owner of a small business, an employee in a large corporation, or head of your own household, I recommend this book for those wishing to make a positive change in their office environments.